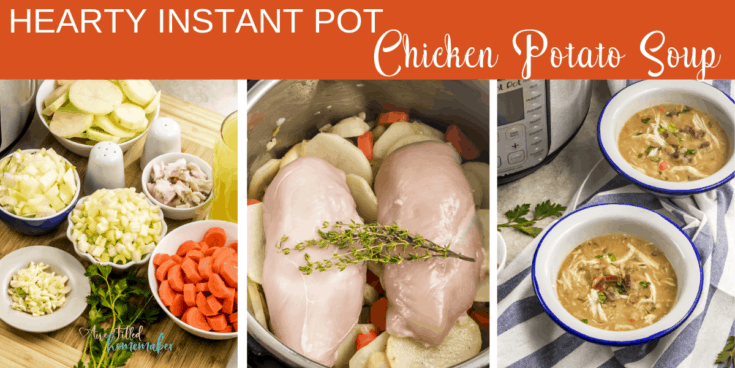 Warm yourself up with a comforting bowl of Instant Pot Chicken and Potato Soup. 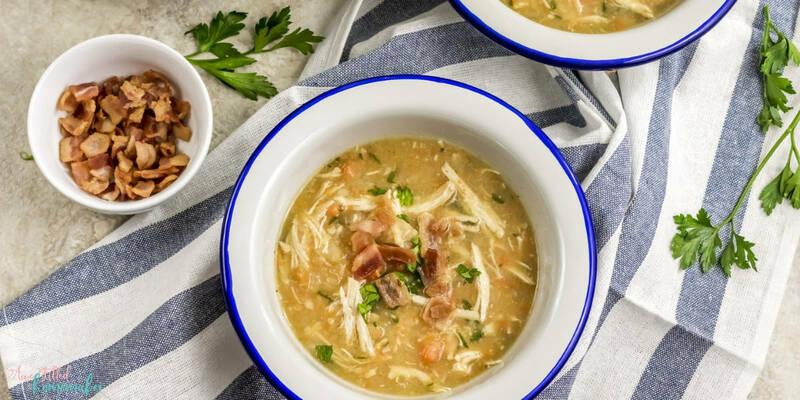 This is a creamy based soup that is loaded with chicken, tender potatoes, onions, carrots, and celery. Top with some crunchy bacon and fresh parsley and you have a dinner dish the whole family will love. In my humble opinion, nothing beats a good potato soup. My husband could eat potato soup every day if I made it for him. 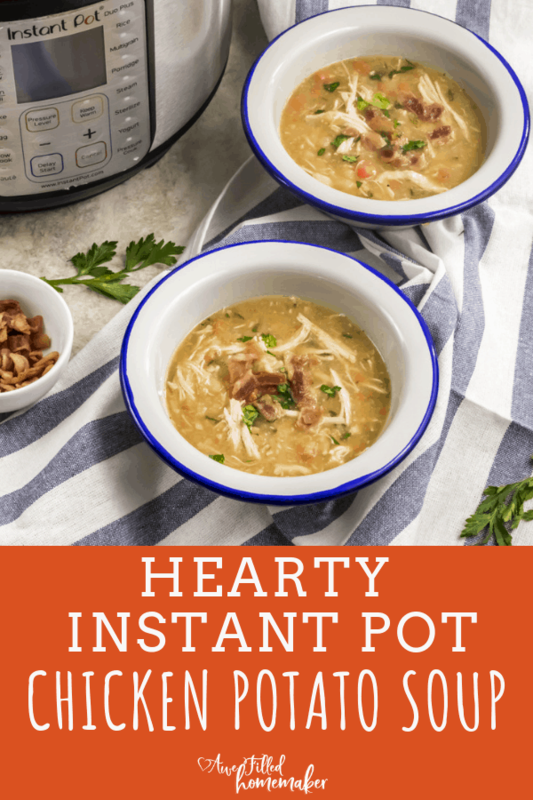 There is something about a potato soup that is packed with flavor in a thick and creamy soup base. It just seems like one of the most comforting dishes in the history of comforting dishes. Don’t get me wrong, I love a good sweet potato chili or Mexican Stew, but potato soup always ranks number one in my home. 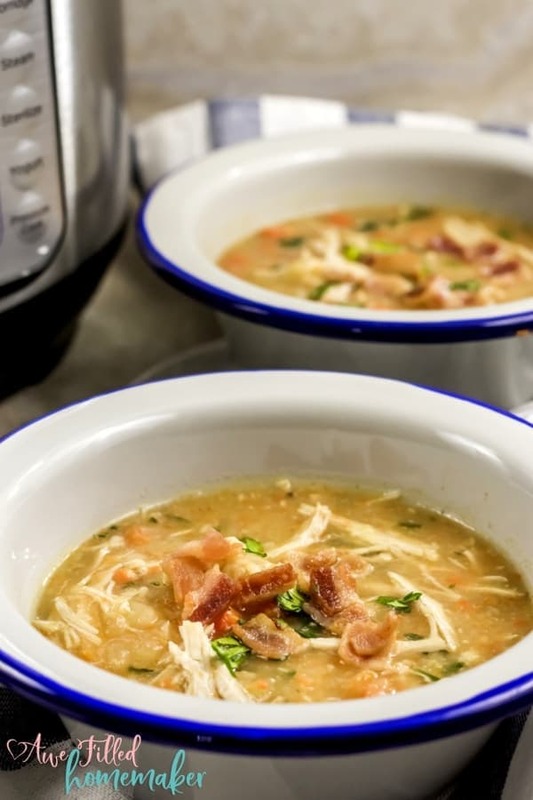 I am gonna share a little secret with you on how to get added flavor into this decadent soup. 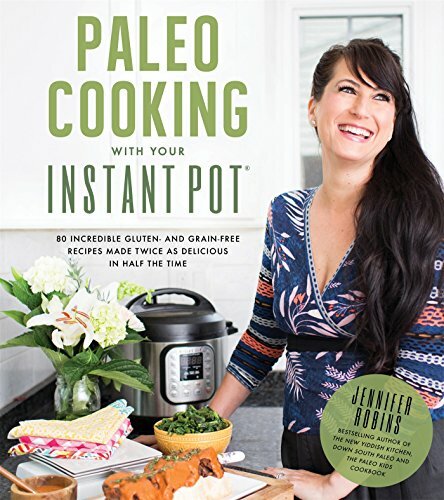 I start by sautéing my bacon in the Instant Pot. Then I follow-up by removing the bacon and setting it aside. I keep what little grease is in there to help add extra flavor to the soup. Then I caramelize my onions in the bacon grease. I’m creating such rich and savory layers of flavor that will be brought out as the potato soup cooks. Then you move on to adding potatoes and other ingredients in and cooking as directed. 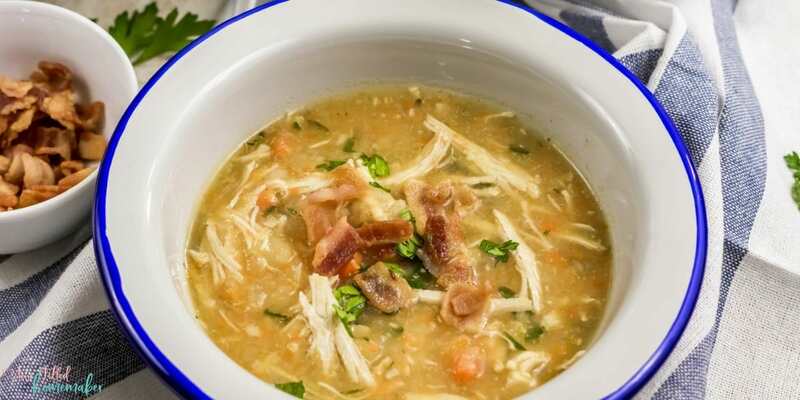 By taking the time to caramelize the onions and sauté the bacon in the pot, you help add so much flavor to the chicken and potato soup. These two steps shouldn’t be skipped over if you want a soup that will leave every guest begging you for the recipe. For this recipe, I reached for a russet potato. Russets offer a slight buttery taste, so they pair well in a soup. The texture of a russet also holds up pretty well during the cooking process. If you don’t have russets, you can always substitute Yukon or even red potatoes. Red potatoes will indeed change the flavor of this soup a decent amount. 1) Turn the Instant Pot on the “Sauté” mode and add the chopped bacon. Sauté for 5 minutes, stirring constantly until the bacon is brown and crispy. Drain it out on a paper towel. Keep aside. 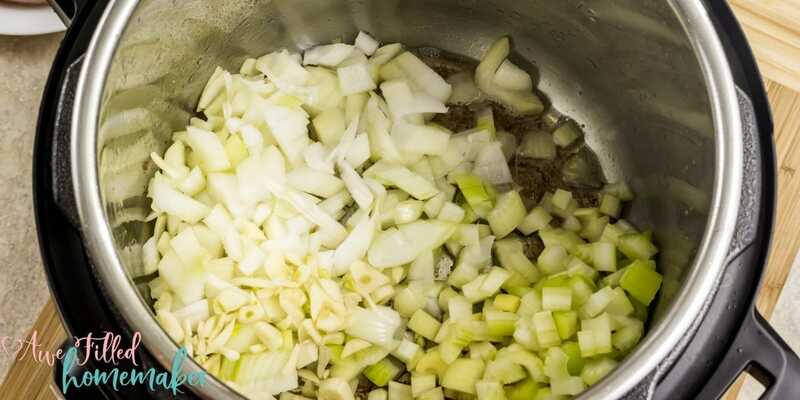 2) Add the chopped onions, celery and the garlic to the leftover bacon fat. 3) Sauté for another 4 to 5 minutes until the onions caramelize. 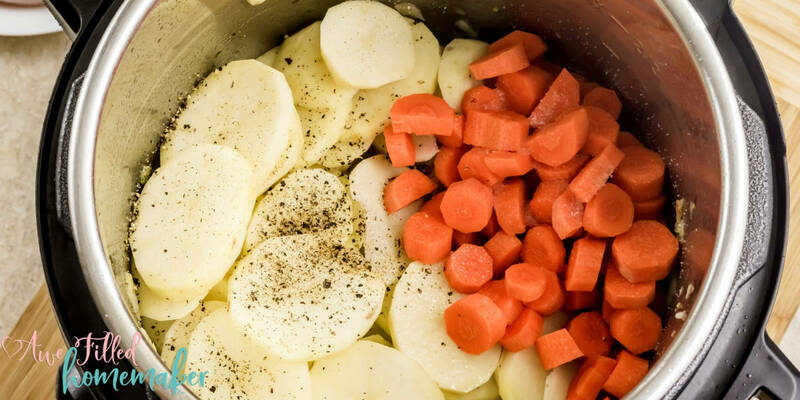 4) Next, add the sliced potatoes and the carrots along with salt and freshly cracked pepper. Give it a good mix. Place the chicken breasts over the vegetables. 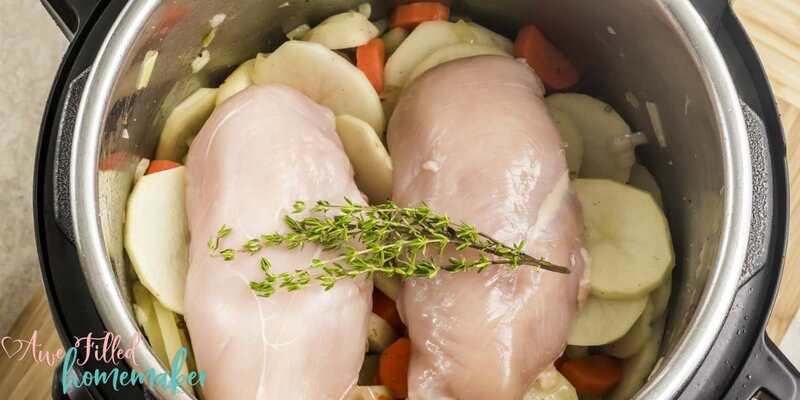 Place the thyme sprig on top of the chicken breasts. 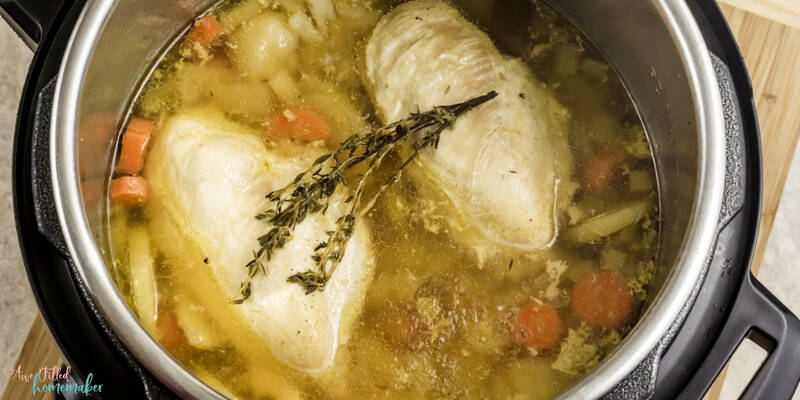 5) Add the chicken stock. 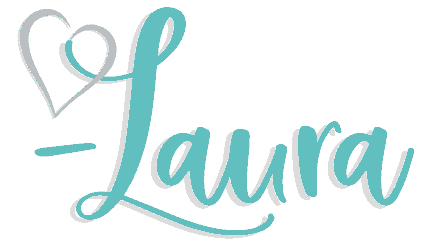 6) Turn off “Sauté” mode. Put the lid on, making sure that the pressure valve is in the “Sealing” position. 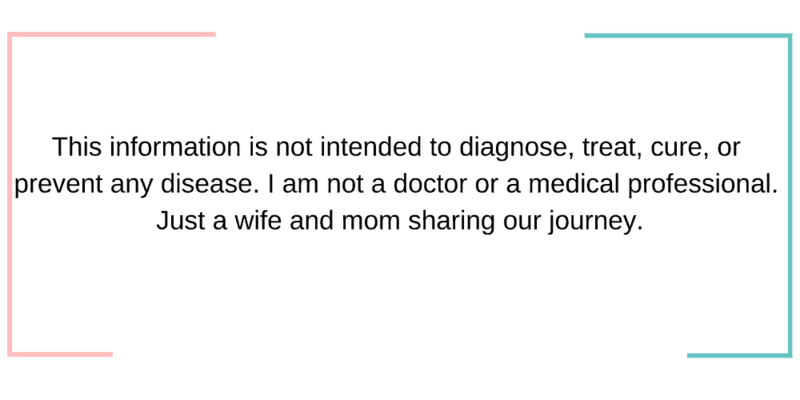 7) Select the “Pressure Cook” mode and adjust the time by using the “- / +” to 10 minutes. 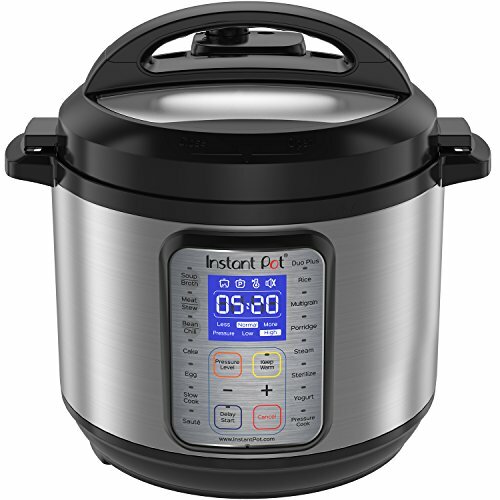 8) When Instant Pot beeps, let the pressure release naturally. 9) Remove the chicken breast and shred it with two forks. Mash the cooked potatoes with a potato masher. 10) Turn on the “Sauté” mode and add the shredded chicken along with chopped fresh parsley. Simmer for 5 to 10 minute or until the soup is thick. Check for seasoning and adjust the salt and pepper accordingly. 11) Serve piping hot, topped with the reserved crispy fried bacon and some fresh parsley. Instead of fresh thyme, add ½ a teaspoon of dried thyme. 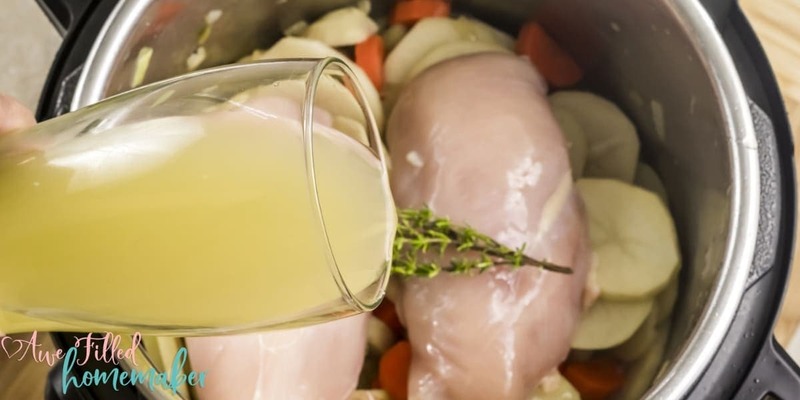 If you are on the hunt for a satisfying and easy weeknight soup recipe, give my chicken and potato soup a try. 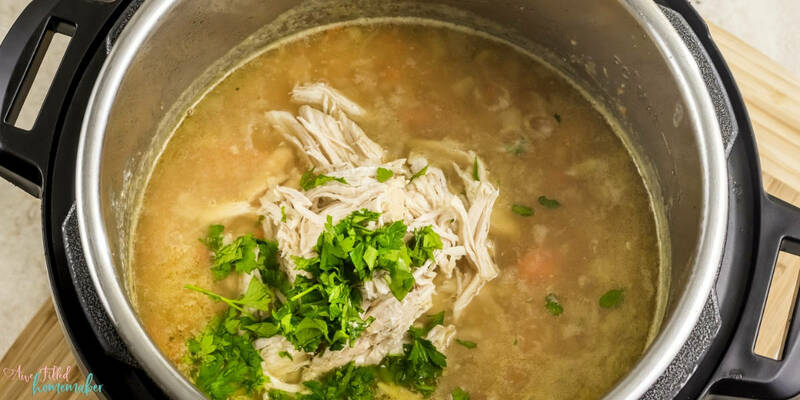 This soup is kid-friendly and a great way to sneak in a few added vegetables into their diet. Pair with some homemade rolls, oyster crackers, or even a side salad to lighten up your dinner. 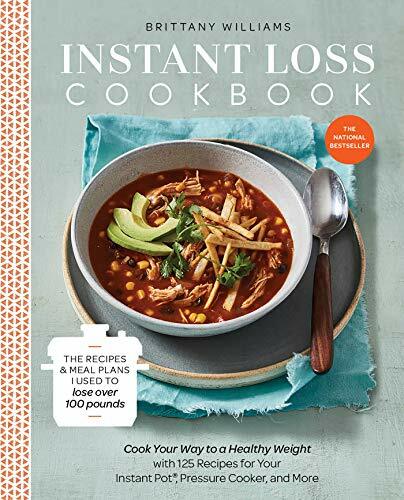 Don’t Forget To Print Out Your Recipe For Later! 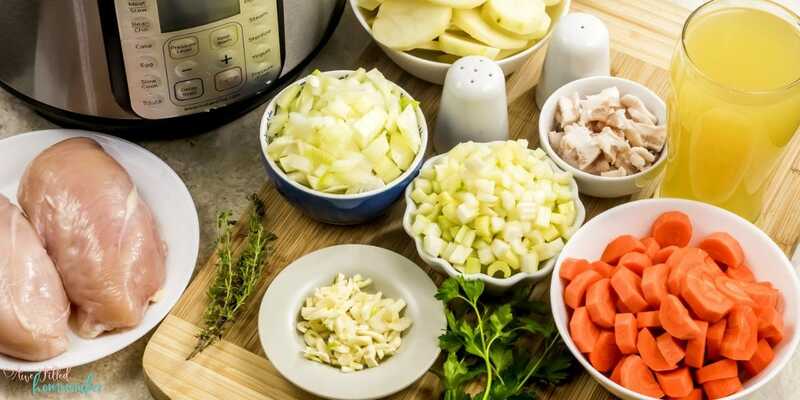 This is a creamy based soup that is loaded with chicken, tender potatoes, onions, carrots, and celery. 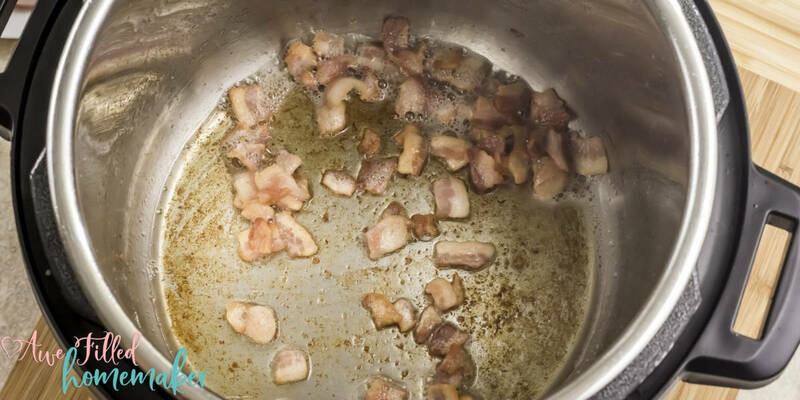 Turn the Instant Pot on the “Sauté” mode and add the chopped bacon. Sauté for 5 minutes, stirring constantly until the bacon is brown and crispy. Drain it out on a paper towel. Keep aside. Add the chopped onions, celery and the garlic to the leftover bacon fat. Sauté for another 4 to 5 minutes until the onions caramelize. Next, add the sliced potatoes and the carrots along with salt and freshly cracked pepper. Give it a good mix. 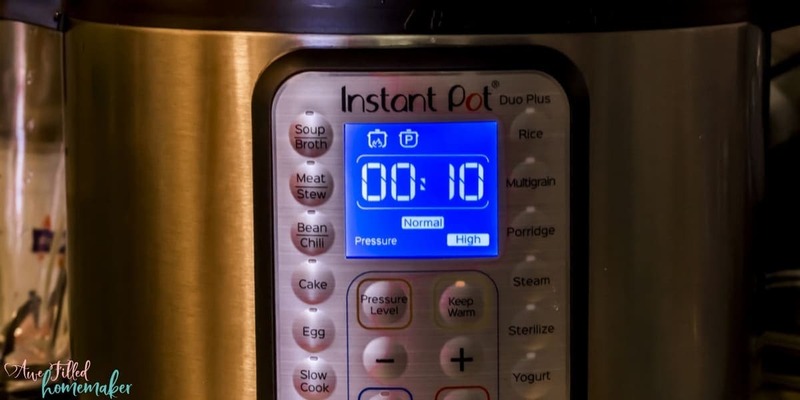 Select the “Pressure Cook” mode and adjust the time by using the “- / +” to 10 minutes. 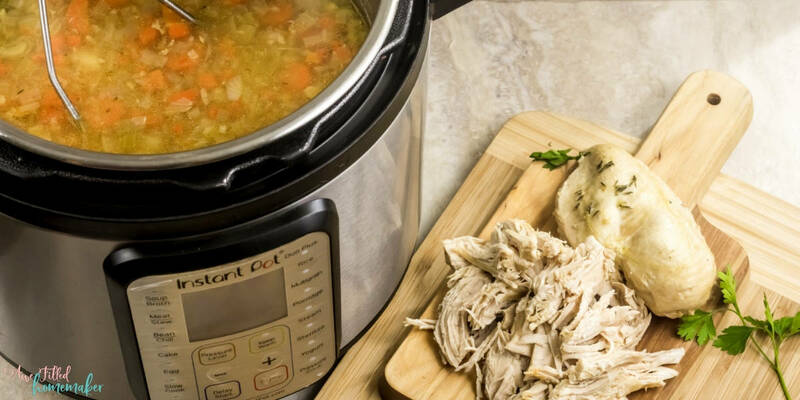 When Instant Pot beeps, let the pressure release naturally. Remove the chicken breast and shred it with two forks. Mash the cooked potatoes with a potato masher. Turn on the “Sauté” mode and add the shredded chicken along with chopped fresh parsley. Simmer for 5 to 10 minute or until the soup is thick. Check for seasoning and adjust the salt and pepper accordingly. Serve piping hot, topped with the reserved crispy fried bacon and some fresh parsley. Instead of fresh thyme, add ½ a teaspoon of dried thyme. 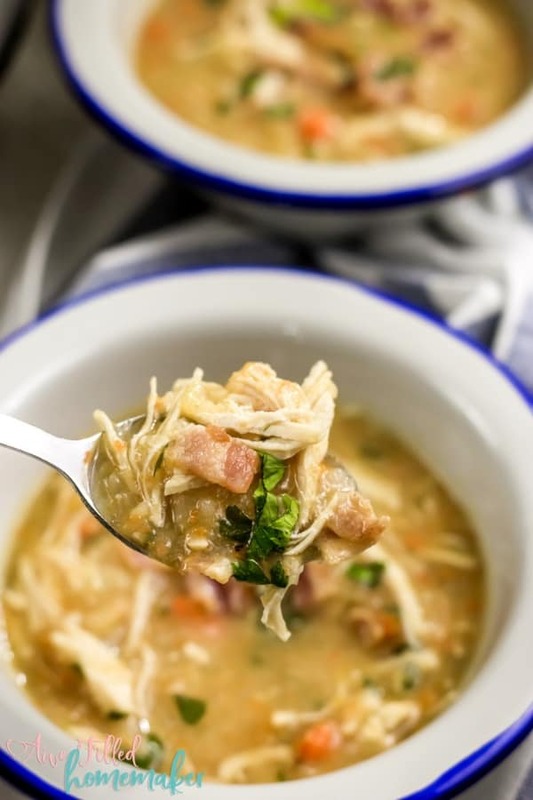 If you are on the hunt for a satisfying and easy weeknight soup recipe, give my chicken and potato soup a try. 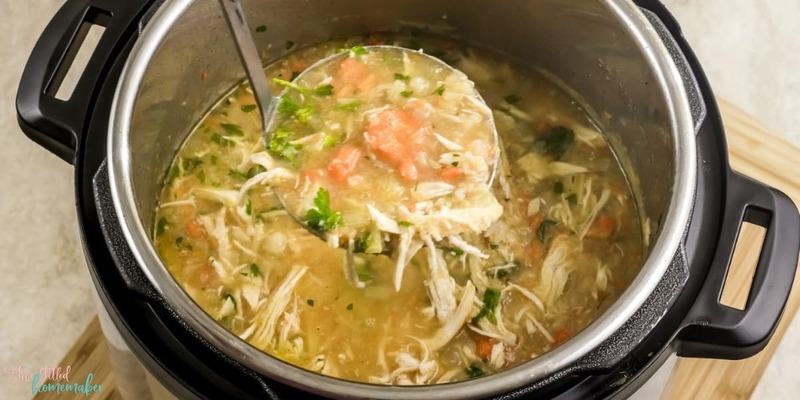 This soup is kid-friendly and a great way to sneak in a few added vegetables into their diet. Pair with some homemade rolls, oyster crackers, or even a side salad to lighten up your dinner.